The Strategic Air Command (SAC) was responsible for America’s land-based strategic bombers and nuclear, intercontinental ballistic missiles from 1946 to 1992. 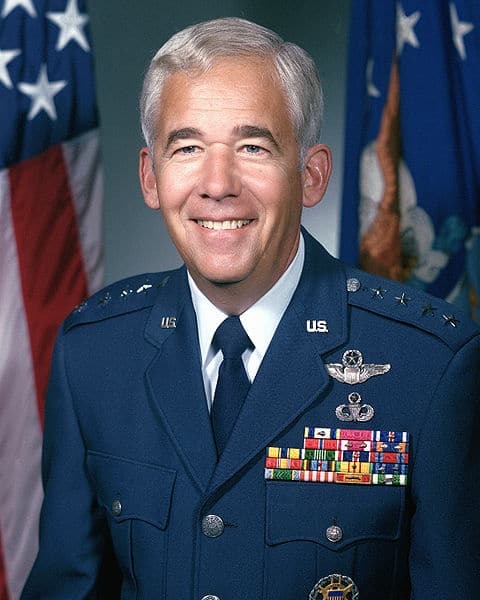 General Jack Chain was Commander-in-Chief of SAC from 1986 to 1991. What was your approach to leadership when you took command of SAC? Chain: The day after I was sworn in I invited all the officers and senior sergeants on the base in for a beer, told them who I was, my background, what I expected from them, and what they could expect from me. Then I went out to all 52 bases in the world, with 132,000 people, to introduce myself. They hadn’t seen a Commander-in-Chief in a long time. It was just as important to see our airmen at the end of the Aleutian chain as it was to see the people at Barksdale Air Force Base in Louisiana. They were part of the team, and they all had to know that I cared about them. I was their leader, but I knew that the best thing I could do was to get the team to sign up, agree with, and carry out enthusiastically what I wanted done, rather than just me ordering them. I had to sell ideas down the line because I wanted people to feel involved and proud of what they’re doing so that they’d put in extra hours, or anything else, to get the job done. that I cared about them. How would you describe SAC’s culture? Chain: It was a proud culture. We felt we had the most important role in the U.S. as far as national security because we had reconnaissance aircraft airborne collecting data around the clock, and we had a couple of thousand ICBMs in the ground with warheads on them with young men and women ready to launch those against the Soviet Union. We had bombers that were fully loaded with nuclear weapons and air refueling tankers on alert with maintenance people and guards around them twenty-four hours a day, seven days a week. When you deal with nuclear weapons, anything less than perfect is unsatisfactory. We were hierarchical, top down, holding people responsible, who held other people responsible. We promoted the good ones. The ones who could not lead, who wouldn’t listen, who wouldn’t ask questions, who just dictated, whose subordinate’s morale was bad, we had to get rid of them. anything less than perfect is unsatisfactory. How did the SAC culture differ from other cultures in the Air Force? Chain: It was a nuclear command, and everybody in SAC knew that was job one. One of the first things I did in SAC was to explain we had two missions. One is the nuclear mission, for which you have to be in a 40 IQ mentality. If you have a new idea, don’t implement it until that idea is scrubbed and rescrubbed with outside forces looking at it, because we have to be perfect dealing with nuclear weapons. Were there ever any major mistakes at SAC during your command? Chain: We had a security breach once, and I had the head of the security on every base worldwide flown into Omaha, and I stood them all at attention and chewed them out. I said you, plural, had brought great discredit on the Strategic Air Command. One sergeant did it, but we are the ones in charge of all the sergeants. Your own base may be perfect, but you’re part of a larger team, and our team failed. We should all be ashamed. We cannot let it happen again. What kinds of leadership skills were important to be a good officer at SAC? Chain: You had to take care of your people and care about them from your heart and soul. That can’t be ordered. You have to have that ingrained in you. If I am the squadron commander and I’ve got 100 airmen, they’re my people, not mine to order around, but my people, who I care about. I’ve got to care about all of them. If they are screwing up, I have to discipline them, but I still have to love them. I have to know about their spouse and children, how they are doing at home. I have to worry about all who work for me and be concerned whether they are taking care of the next level, and the next level, all the way down. You can’t tolerate leaders who don’t care about their people. I tried to weed them out as quickly as I could. There aren’t enough hours in a day to screw around with somebody who you’ve given a chance and isn’t performing. But you can’t just stay at the hard edge. You will not earn any support. You’ve got to recognize that if people are going to support you, you have to support them. You have to be able to listen. The command is not one person. It’s all the leaders and their people down to the youngest. Does excessive ego ever trip up leaders in the Air Force? How important are a person’s personal values, a moral compass, and integrity? Chain: The Air Force has a standard that does not tolerate violation of moral well-being. There’s zero tolerance for alcohol abuse and sexual misconduct. When I was a captain and an aide to a general, who had a tendency to drink too much, I allowed him two drinks. After his second drink, I’d intercept the waiter and say, “Bring him a glass of water.” When the waiter delivered the water, the general would glare at me and raise his thumb at me, and that was his signal: calling me a “dumb …”. In other words, I was chewed out. Fine, I didn’t mind being chewed out because I knew the next day he would not say anything, and he knew what I was doing. I was keeping him from being embarrassed by doing something dumb in front of other people. You often speak about leaders doing things right. Can you give us an example of making a tough but right choice from your career? Chain: The Air Force has a National Guard, the Army has a National Guard, and they each have a two-star commander, who reports to a three-star commander of the National Guard Bureau, who was traditionally an Army three-star general. The National Guard Bureau three-star commander was going to retire. The Air Force and Army each nominated a two-star for the position. I was a three-star at the time and was called in by the Chief of Staff of the Air Force, who said I was going to be chairman of the Promotion Board. Two Air Force two-star generals and two Army two-star generals were also going to be on the board. The President of the United States passed the word he would like the Air Force candidate to be the selected, as would the Secretary of Defense, the Secretary of the Air Force, and himself, the Chief of Staff of the Air Force. I knew the Air Force nominee well and was sure he would do a great job. The next day the Board met. An officer from the Judge Advocate General Corps swore us in, telling us it was very important selection job and that we needed to be objective and honest with no preconceived ideas in the selection. It had to be on merit, capabilities, and a thorough review of their backgrounds. So, the two Air Force generals and the Army generals reviewed the records. I knew this would be a slam-dunk because the Air Force guy was fairly good. When it was time to vote, I expected four votes for the Air Force, but there were two votes for the Air Force and two votes for the Army. The Army generals explained why they voted the way they did, and the Air Force generals explained why they did what they did. Both acknowledged that the other service’s candidate was very good, well qualified, and competent, but still they voted for their own candidate. After 45 minutes of discussion, the vote was still two-two. So, I went through the records myself. The Army nominee’s record showed he had two tours in Vietnam, a tour in Korea, had commanded a number of different army units, had a master’s degree, and a great amount of civilian experience. The Air Force candidate’s record reflected that he came into service after the Korean War, somehow had managed to miss the Vietnam War, had flown basically training missions, had a lot of staff time, some operations time, and had not had many command positions but had won the hearts and minds of the senior Air Force leadership. I had an ethical dilemma because I’d been told that the President on down wanted the Air Force to win. But I had been sworn in to “do the right thing.” I knew deep down that the Army candidate was the better one and had earned the promotion. It was a dilemma for me. However, given the facts, I had to vote for the Army candidate. and get punished for it, so what? Authors’ Note: After Jack Chain’s retirement from the Air Force, he signed a contract to be Executive Vice President of Burlington Northern Railroad. When approached later to become CEO of a large, prestigious firm where his skill set was a great fit, he declined because he had signed a five-year contract with Burlington. “A contract is a contract,” he explained. Bob and Gregg Vanourek are authors of the new book, Triple Crown Leadership: Building Excellent, Ethical, and Enduring Organizations (McGraw-Hill, 2012), based on interviews with 61 organizations in 11 countries.